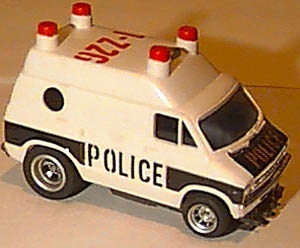 The 1946 Police Van is quite similar to the 1937 Dodge Van Rescue Vehicle and also utilizes the same body as the Dodge Van. The cap assembly with sirens is screwed on. This model was released in White/Black #1-226 and Blue/Black/White #1-226. There are no other known variations. This car was released only on the Specialty Magnatacion chassis. This van is NOS still banded in the original box. You can't get it any newer than this. NOTE!!! The label on the box may be a reproduction!